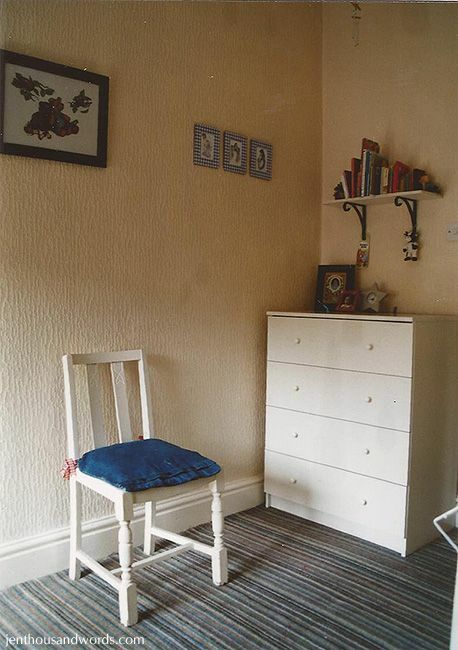 Ages ago my friend Rhonda asked if I'd do a post about Daniel and Noah's bedrooms through the years, and how I decorated and organised them. I'm finally getting around to it! 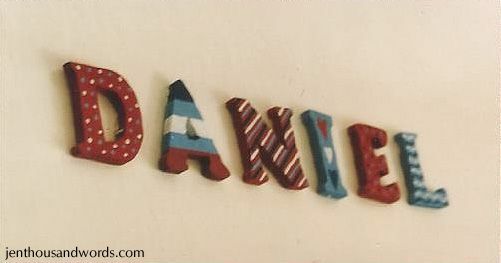 Before Daniel was born I had planned on what kind of room he'd have. 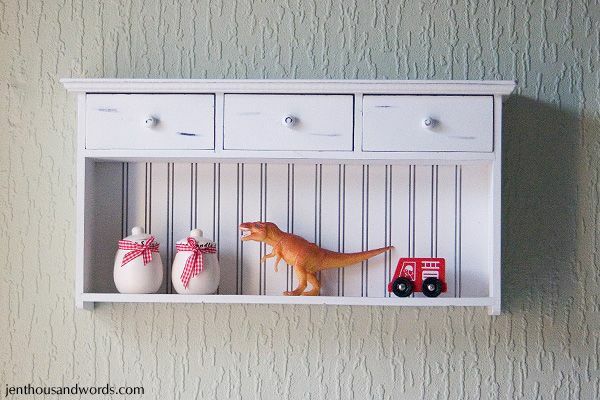 Although we were renting and couldn't really decorate his nursery when he was born, my vision of what it would eventually be like influenced our choice of furniture (white) and had me creating little decorative touches in preparation. 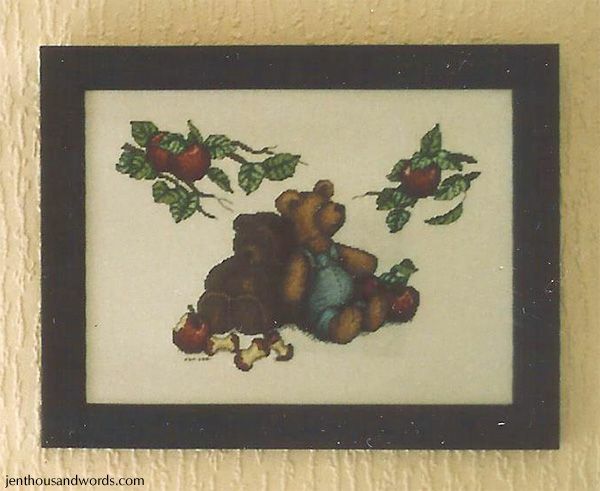 In fact, I was cross-stitching long before I even fell pregnant. It was only once we'd moved into our own house and Daniel was two years old that I finally got to put his room together the way I'd imagined it. 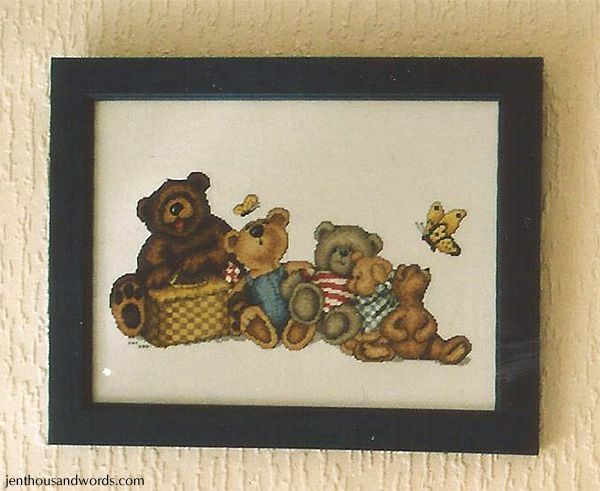 The "theme" was dark red, denim, light and dark blue, gingham, white, teddies, with a country feel. 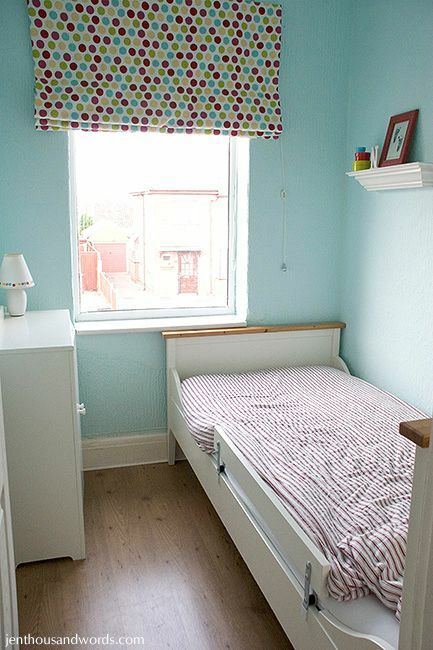 He had a white bed from Ikea, and a white chest of drawers which held most of his clothes. He also had a white wardrobe (not pictured). We didn't store toys in his room; they were downstairs. The white chair was a thrift store find, as was the denim cushion on it that I sewed red gingham ribbon to. His bed linen was plain navy on one side and a lighter blue on the other side. 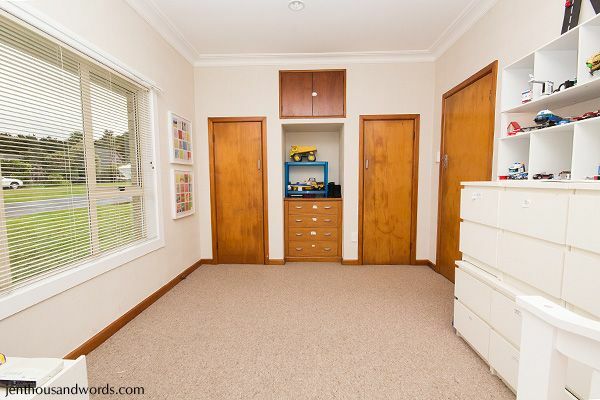 We painted the walls an oatmeal colour. (The photos below are scans of prints (I had a film camera then, not a digital one), so please excuse the quality.) This was before we ripped out that old striped carpet. I painted and distressed this little red frame. 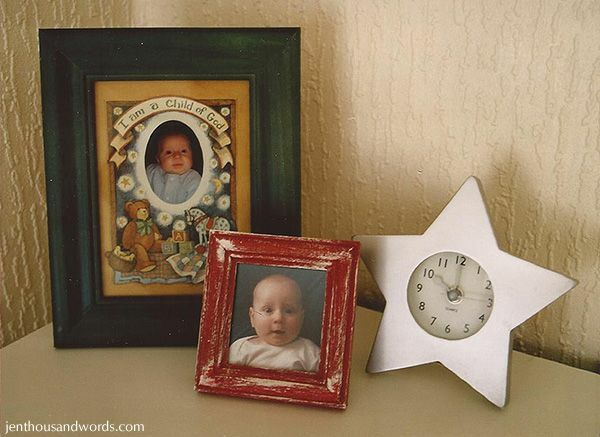 The clock was from Woolworths (one of the first purchases I made way back when we first arrived in England) and the navy blue frame was very inexpensive - the insert was a gift. These frames were from a clearance store and I found the sketches on the internet. I stitched these two cross stitch pictures and framed them in dark blue frames from Ikea. 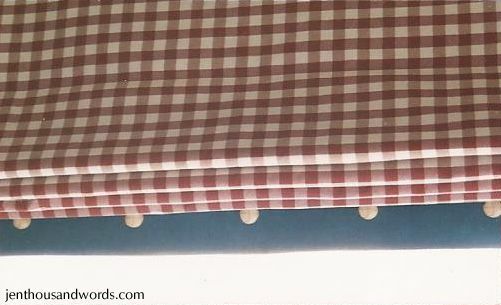 I also made a Roman blind - my first time making one. 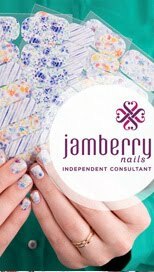 It was lined with blackout fabric and had a denim band at the hem and wooden buttons. I painted this wooden mirror from Ikea, and these little wooden letters that went on the door. When Noah came along I moved the country decor to his room. The boys shared for a while and we used Daniel's old room as a guest room. 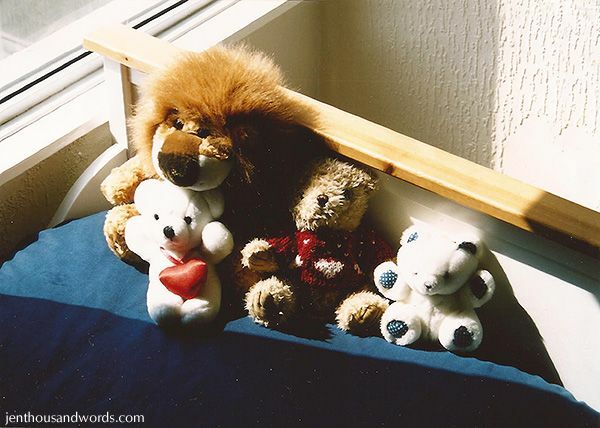 I bought a baby mobile on eBay, pulled off the toys and replaced them with teddy bears. I bought the striped rug at Ikea. 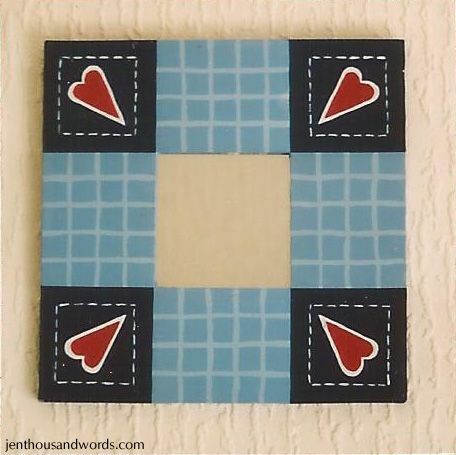 I added little wooden hearts that I'd painted red to the gingham frames. I added some navy blue ric-rac to a plain white bed skirt. We left the built-in shelves empty as Daniel just used to pull everything off them. Here's a closer shot of the layout I created and framed in an Ikea frame. The quote says, "I loved you too much to just be friends so God made us brothers." 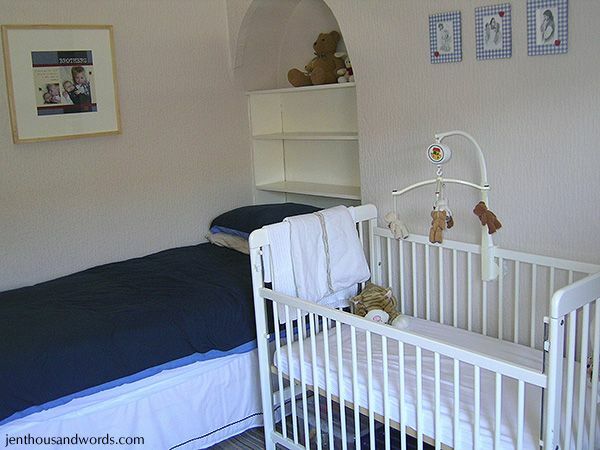 The chest of drawers held clothes and blankets; the basket held burp cloths. 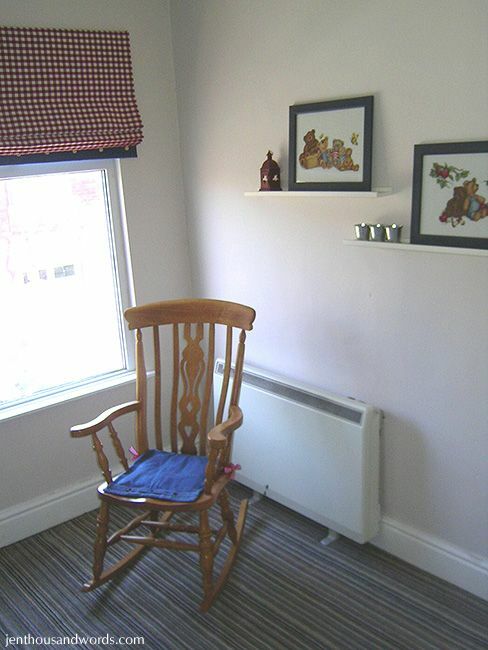 I moved the blind to this room and switched out the white chair for a rocking chair (eBay). 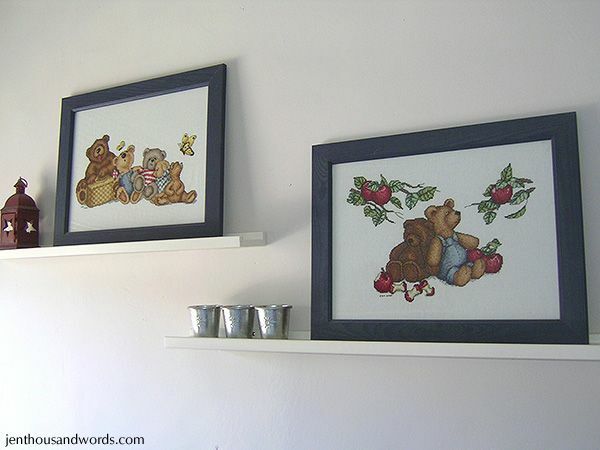 The cross stitched pictures went onto picture ledges from Ikea, with a couple of little accessories. Before too long Daniel went back into his own room. 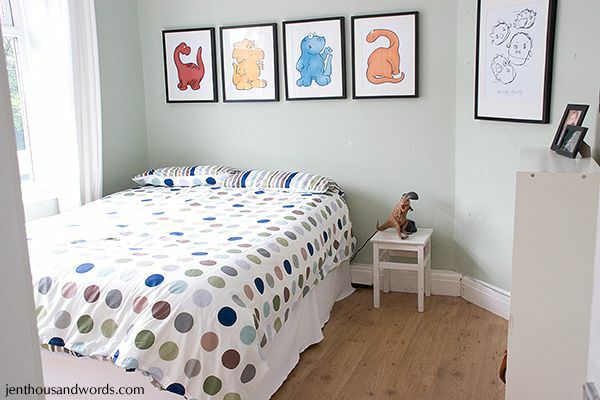 By this time we'd repainted the walls sage green and replaced the carpet with laminate flooring. There were black and red accents. 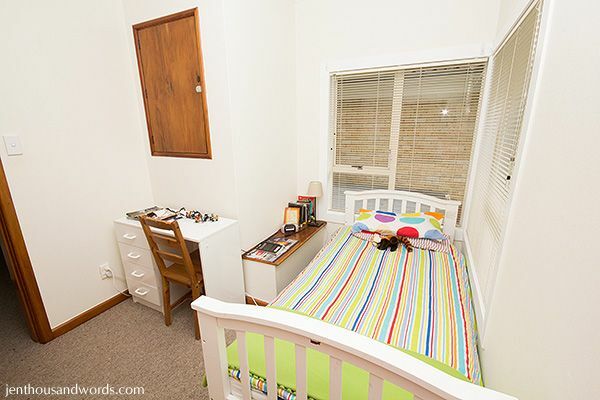 The red and white striped ticking duvet cover was from Ikea, as were the white curtains. I added ribbons to the baskets, which contained socks, gloves and hats. The files on the bottom shelf are scrapbooks - they were too heavy for him to pull out. 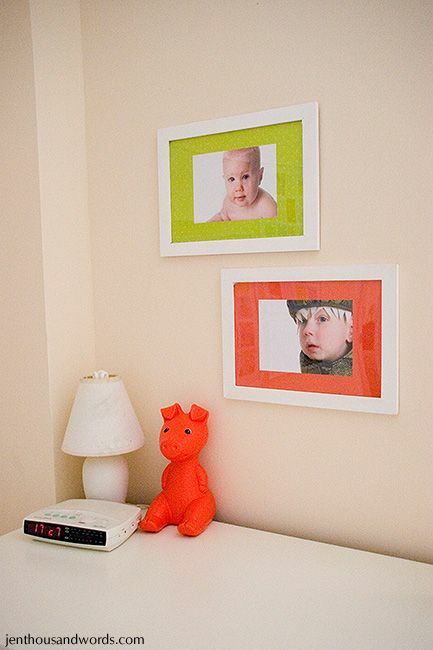 I created digital collages of some of Daniel's baby photos and framed them in black frames. The end of his bed extended into a little nook, in which I hung a dinosaur poster framed in an inexpensive Ikea frame that I painted black. 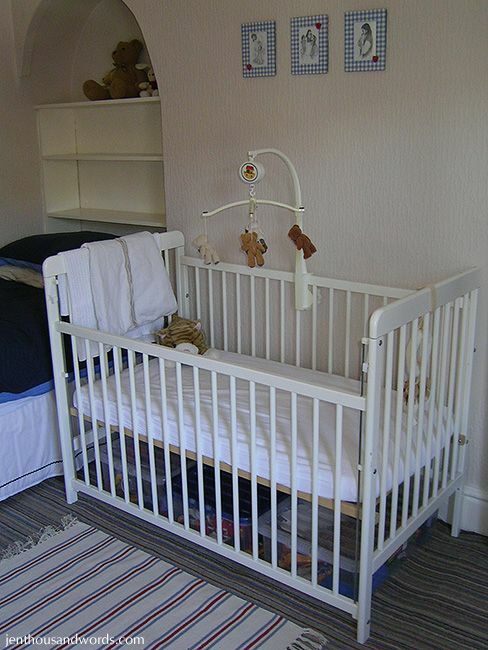 The shelf above his bed was from TK Maxx. 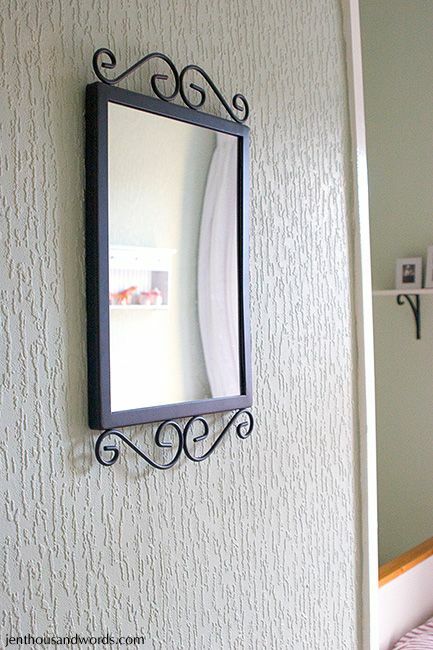 I can't remember where the mirror was from (probably Ikea) but it was super cheap. We then moved into a different house. 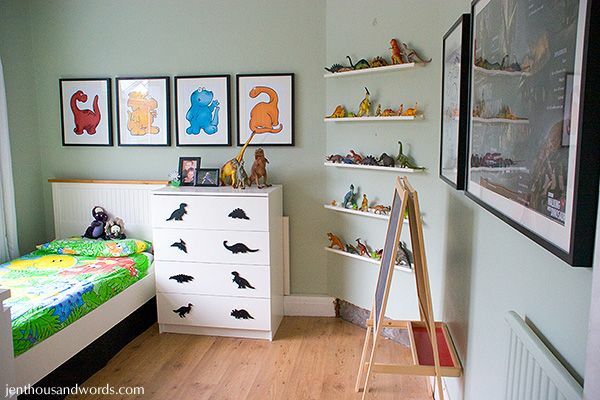 Daniel's room kept similar colours but there was more of a dinosaur theme going on - he was obsessed with dinosaurs! 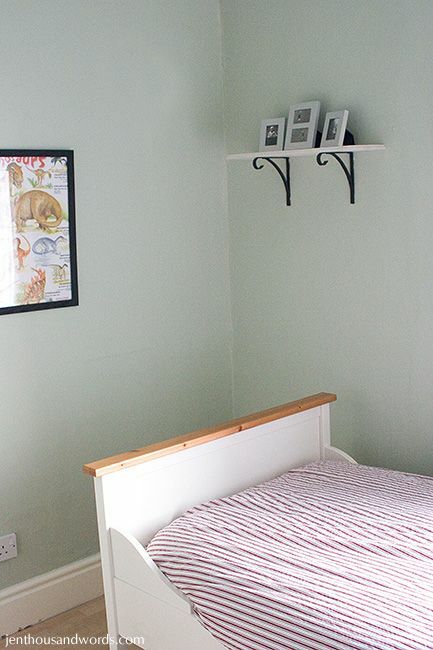 We painted the walls the same sage green as in the previous house, and installed laminate flooring. 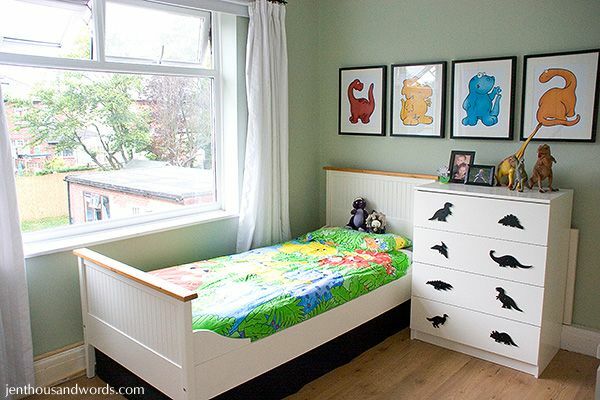 The dinosaur duvet cover was from Asda and I added a black bed-skirt (really just a piece of fabric) to hide the spare mattress under his bed. 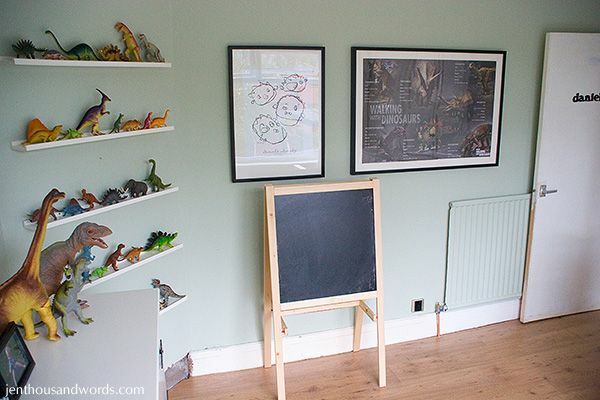 I made the dinosaur pictures - I found a font that was dinosaurs instead of text, coloured them in Photoshop and had them printed, then framed them in Ikea frames. I painted the radiator the same colour as the wall so it would blend in. 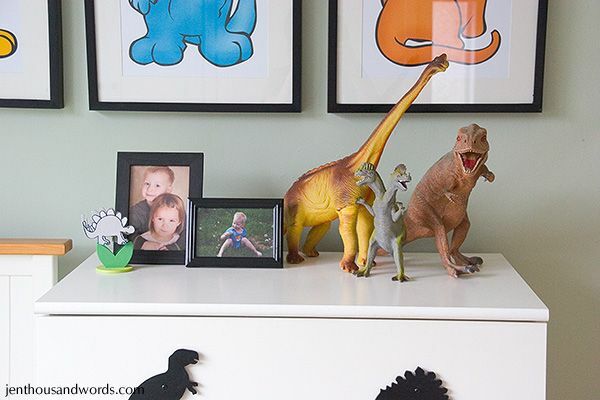 Ikea picture ledges came in handy for storing and displaying Daniel's dinosaur collection. 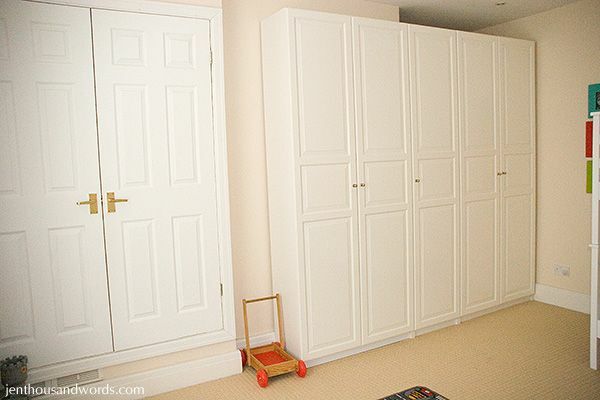 Huge Ikea wardrobes provided tons of storage. 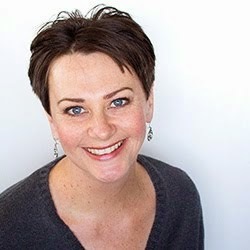 If you want to see inside click on over to this post. 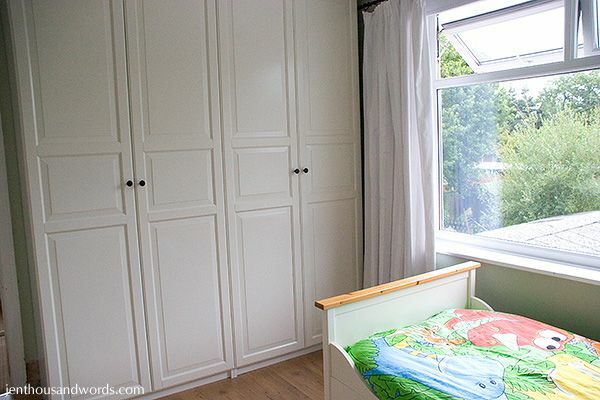 The left hand wardrobe had hanging space for spare clothes and shelves for spare pillows and bedding. I made the knobs out of wooden shapes that I painted black and attached with a spacer - a stack of washers, I think. I painted the screws black so they'd blend. 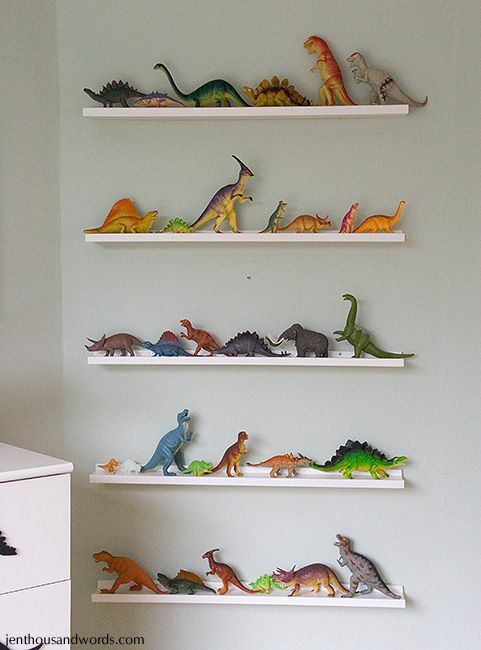 Unfortunately, Noah used to toddle over and spin the dinosaurs so they'd sit wonky and drive Daniel and me crazy. 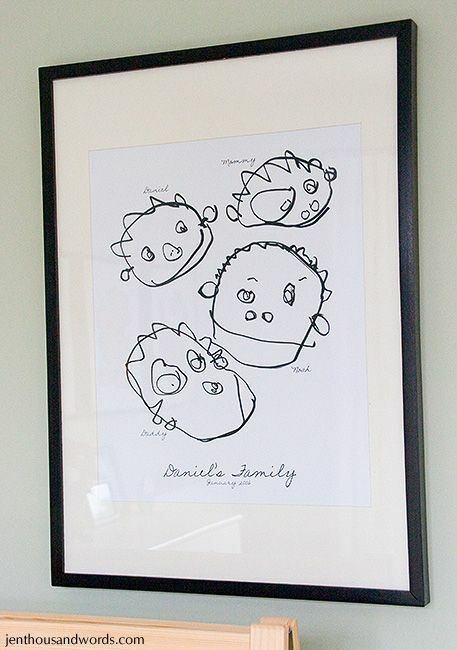 I scanned a drawing Daniel had made of our family and printed it big and framed it in an Ikea frame. 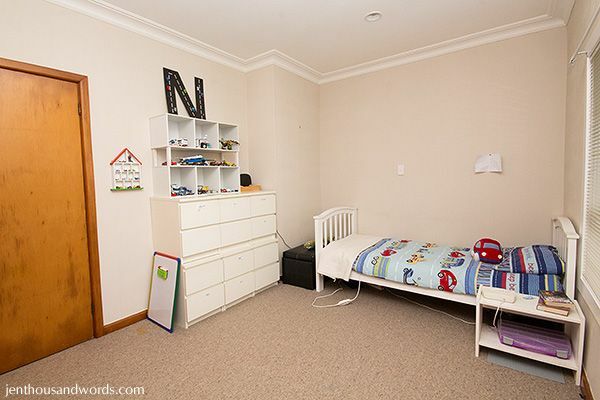 Noah's room was a teeny tiny box room. 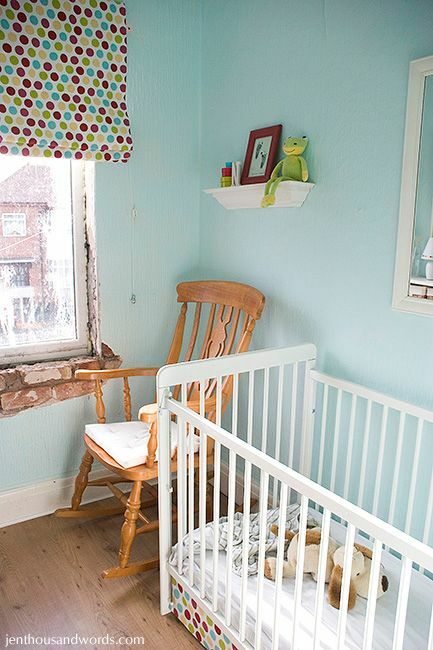 Here are some photos taken after I painted the walls a lovely clear aqua, replaced the carpet with laminate flooring and replaced the window (obviously we hadn't finished off the wall around the window yet, or replaced the windowsill.) 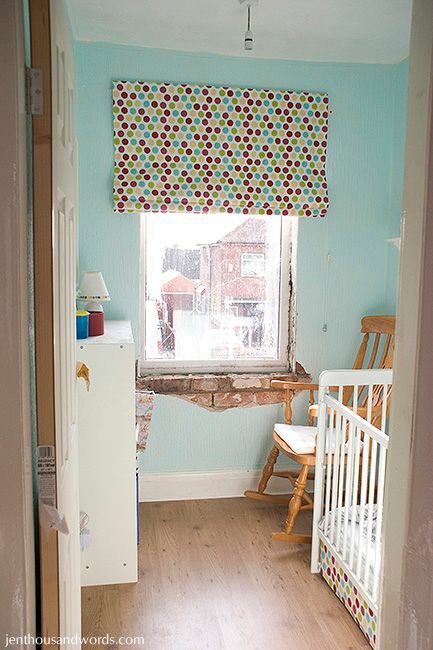 I made the Roman blind (lined with blackout fabric) and a matching skirt for the cot (crib). The rocking chair got a white cushion to blend in better. 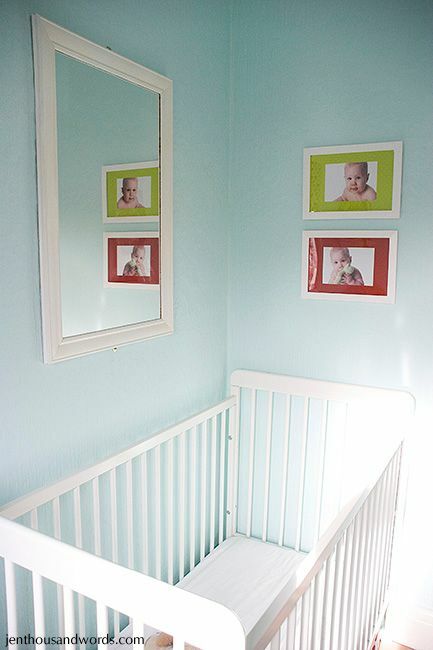 I painted a mirror frame white and we screwed it to the wall above the cot so Noah couldn't pull it off. 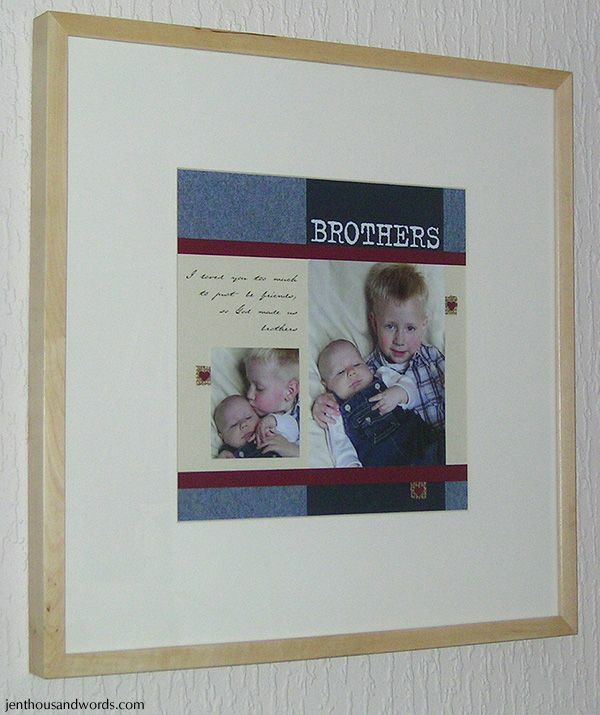 A couple of photos of Noah matted on scrapbooking paper, in cheap Ikea frames painted white, added some colour. 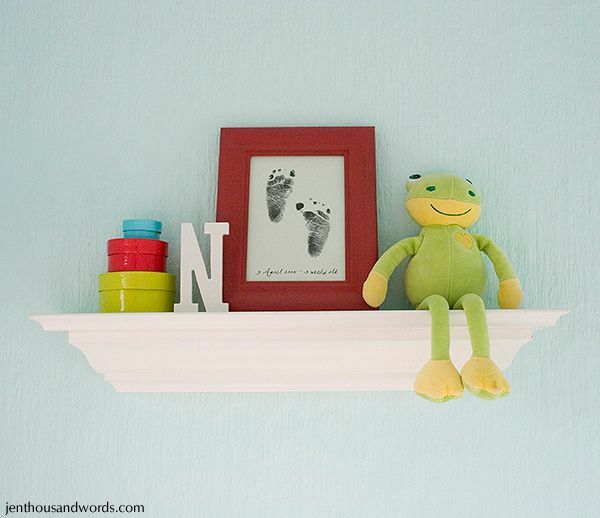 The shelf above the rocking chair: The footprints are Noah's when he was 3 weeks old. 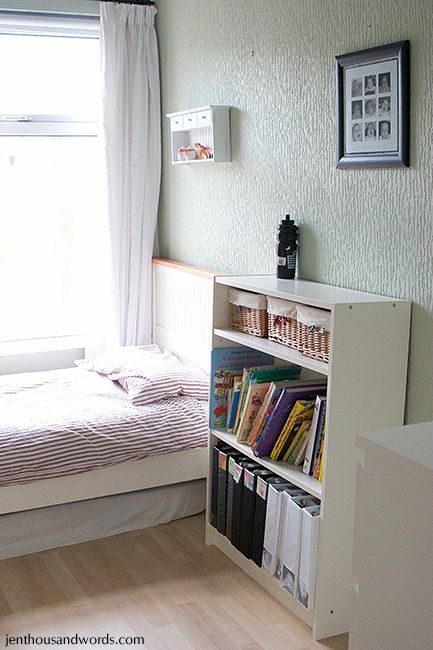 The only real storage in his room was this bookcase (Ikea, of course.) 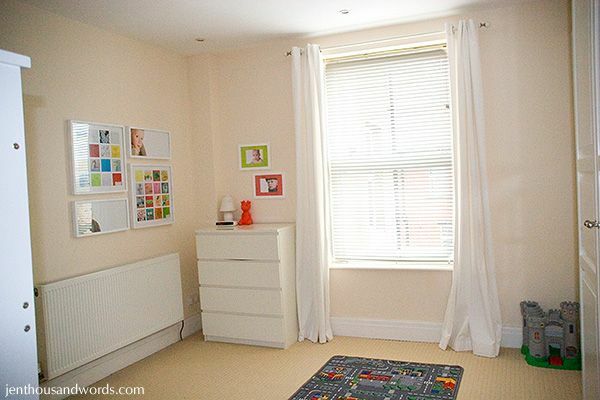 We stored his clothes in drawers in our bedroom (click here to see - his drawers were in the bay window). 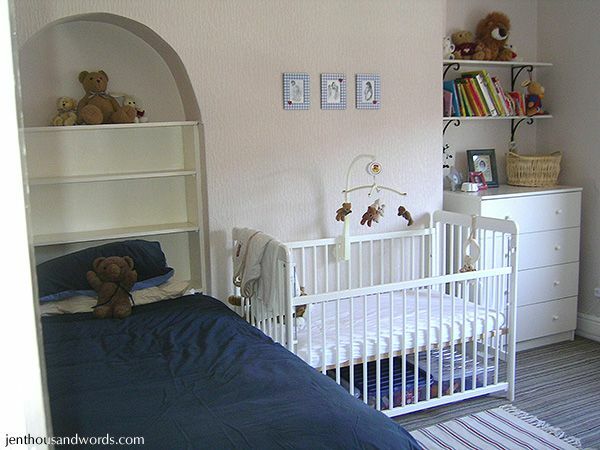 The baskets on the bookcase contained things like bibs and burp cloths; the plastic tub contained spare blankets. On top of the bookcase - I painted this little wooden container (which I got as a gift filled with bath goodies) and added a little metal tag that said "Sweetheart" on it. This contained his dummies (pacifiers). 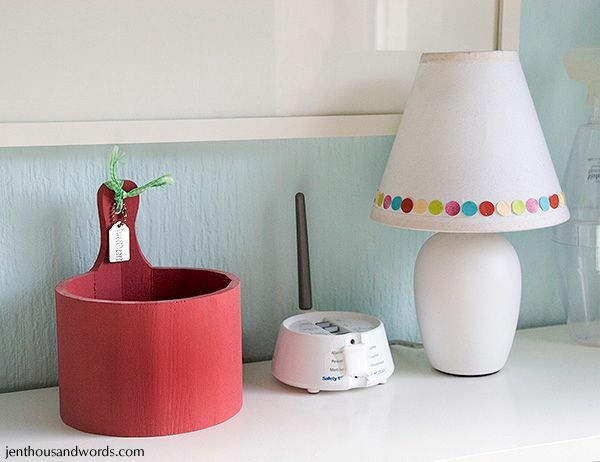 I added the paper dots to the lamp shade to match his blind and cot skirt. Daniel's room was de-dinosaured somewhat in preparation to market the house (we removed the ledges and patched the holes), and he got a queen sized bed that had been passed on to us. Onto the next house! The boys shared a room. 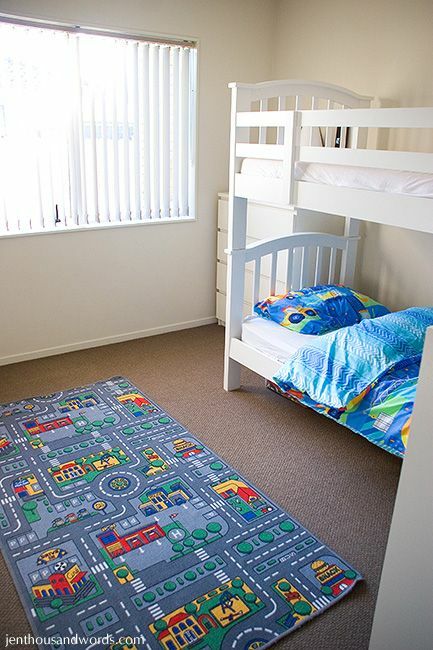 The bunk beds were from eBay, wardrobes and chest of drawers were from Ikea, and the duvet cover sets were from Asda. I found three mismatched frames at TK Maxx and painted them with acrylic paint. They contained pictures of the grandparents with Daniel and Noah. 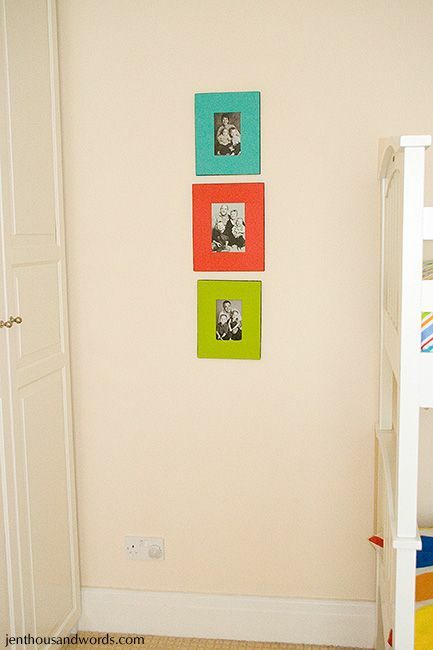 I switched out one of the photos of Noah for a picture of Daniel in a dinosaur costume. 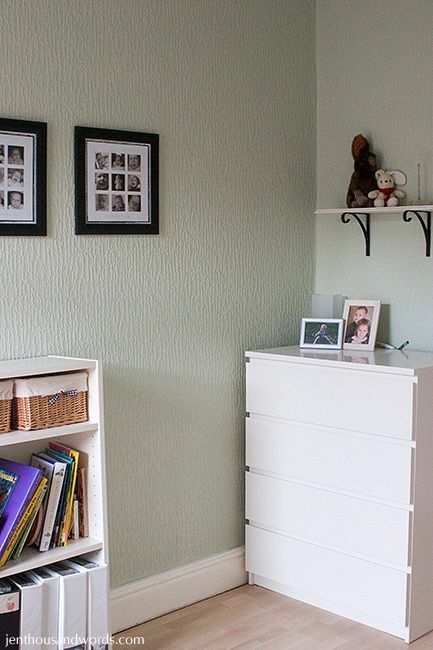 If you want to see how I organised their chest of drawers and all of that wardrobe space, click on over here. 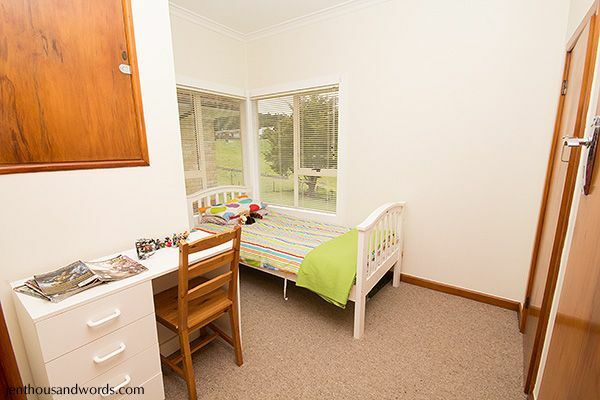 The next bedrooms that they had were in our first house in New Zealand. 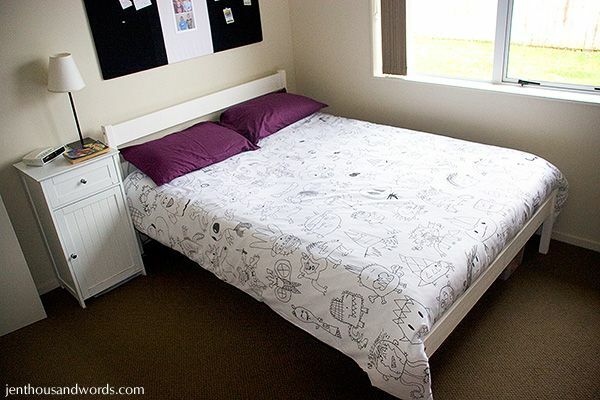 Daniel had a double bed - I traced his drawings onto a plain white duvet cover (click here for details). 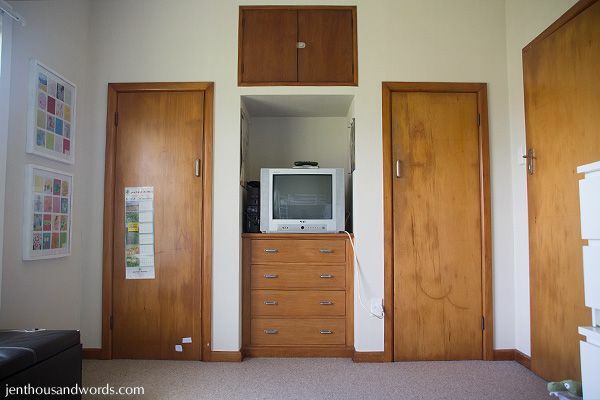 We later added a white desk that a friend was throwing away, so it was quite a snug fit in his room. 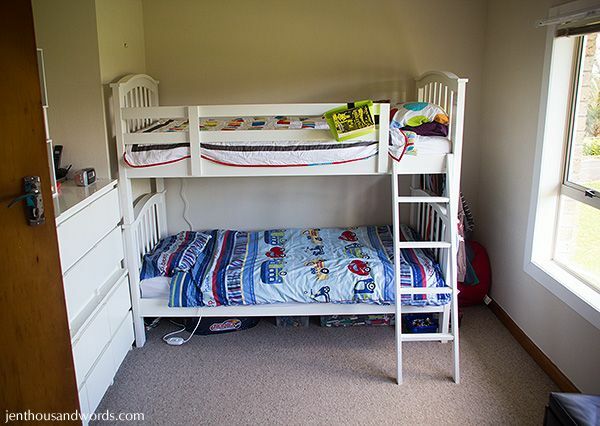 Noah's room had the bunk beds in it. 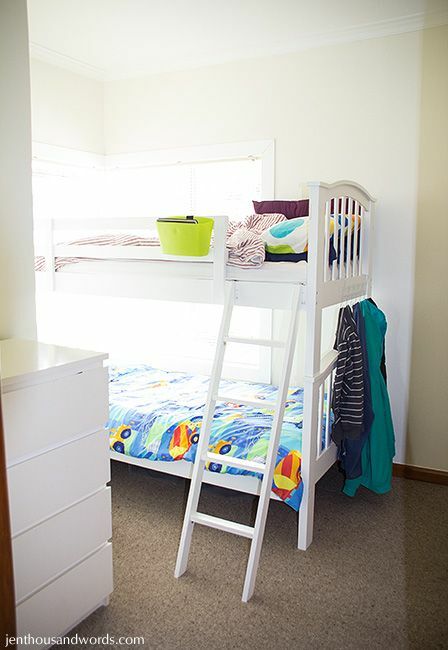 This was handy when we had guests - Daniel could sleep on one of the bunks, freeing up the double bed and room for our visitors. 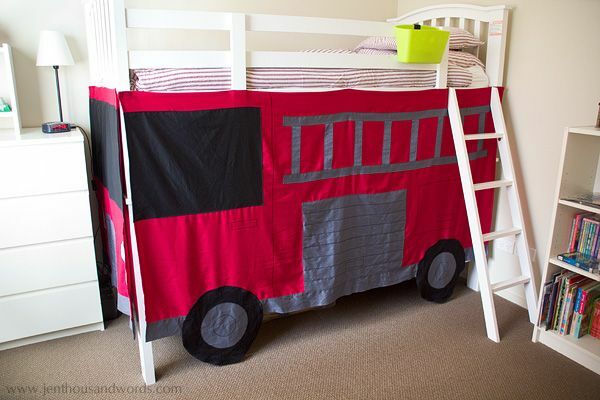 I made the fire engine bed tent (click here for details). 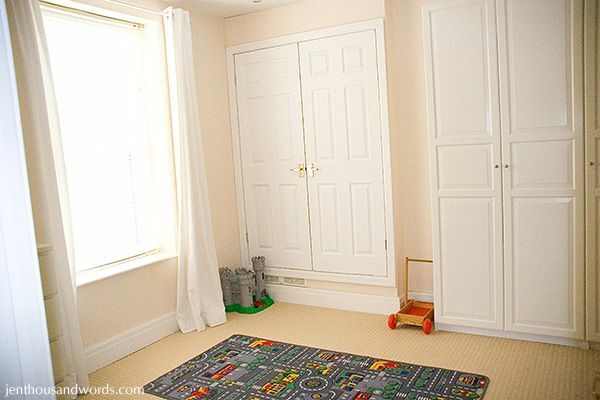 If you'd like to see how I organised their closets you can see Daniel's here and Noah's here. We were forced to move when the landlord sold the house, so the last photos are from our current home. 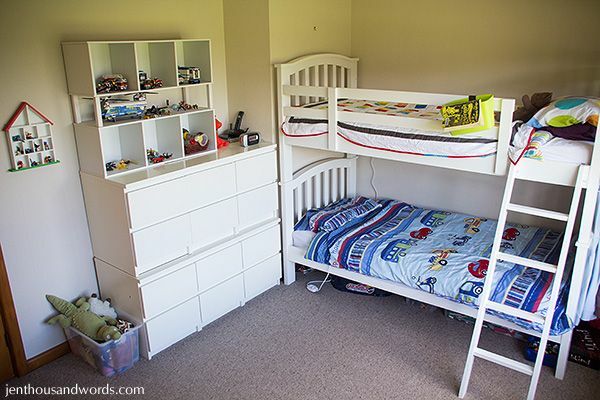 The boys started out sharing a teeny tiny bedroom and using a bigger one as their playroom. 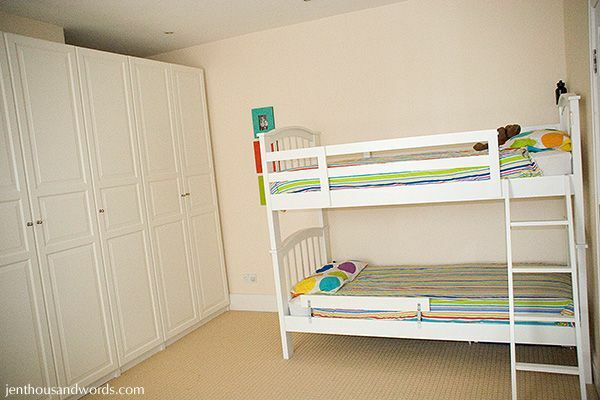 Their hoodies were stored on hooks at the end of the bunks, their clothes were in the closet and the chest of drawers, and the built-in cupboard above the chest of drawers stored miscellaneous things like my photography equipment, spare bedding, etc. 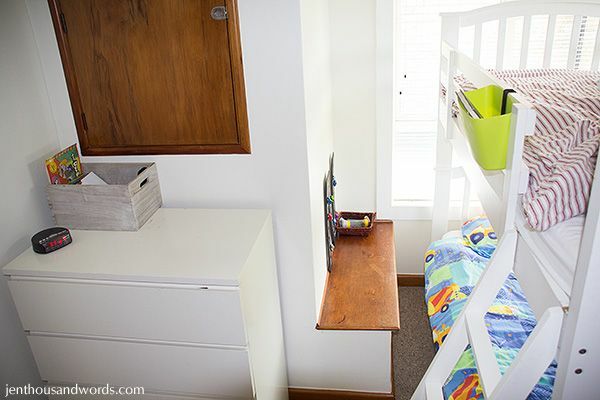 After a while we moved their bunks into the playroom, freeing up the small room so I could have a craft room. 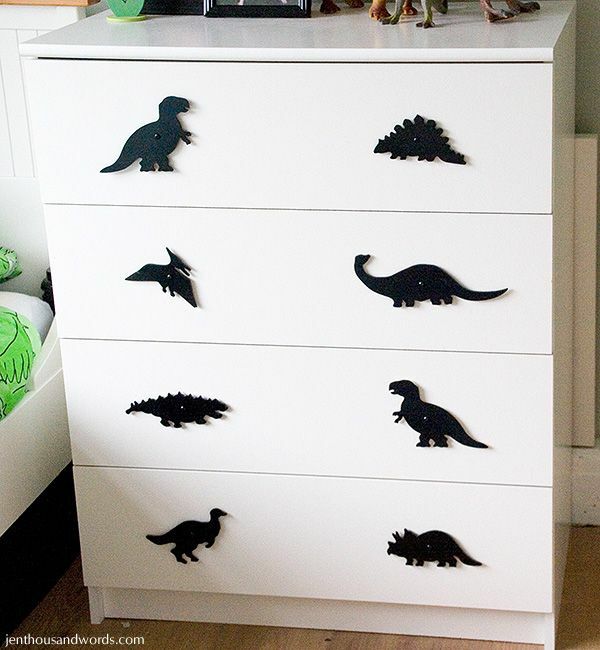 The drawers (all nightstands from Ikea) held toys. 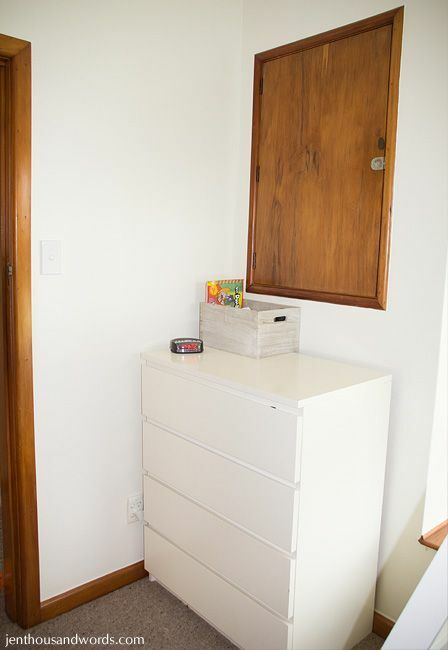 The closets and chest of drawers held clothes. Daniel is 12 now, and at the age where he wants a bit of space to himself. I wasn't using my craft room as often as I'd like, so it was a no-brainer to move Daniel in there. They boys are enjoying having their own rooms again. Here's how they look now (I've used a wide angle lens so you can see the rooms a bit better). 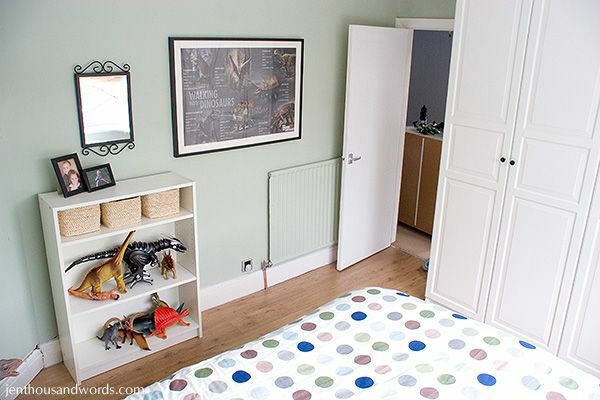 The rooms aren't really decorated, but I have a few ideas that I'm hoping to put in place over time to make the spaces more exciting and personalised. 1) This may not appeal to everyone but in my home almost all of our furniture is white. 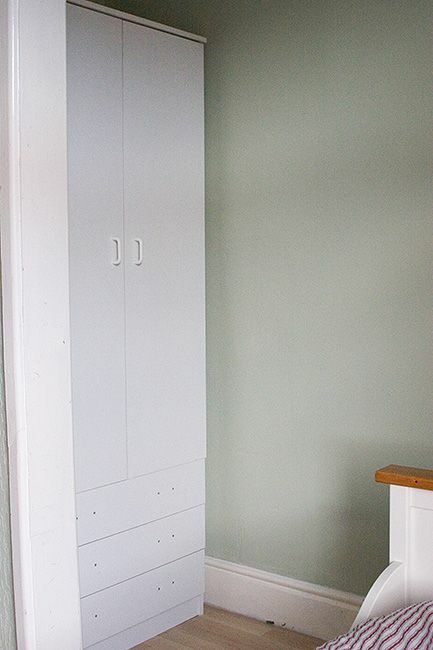 This means that when we move to a new house (which seems to happen often for us - click here to see why) we can shuffle furniture from room to room and repurpose items and they all still go together, no matter which room they end up in. 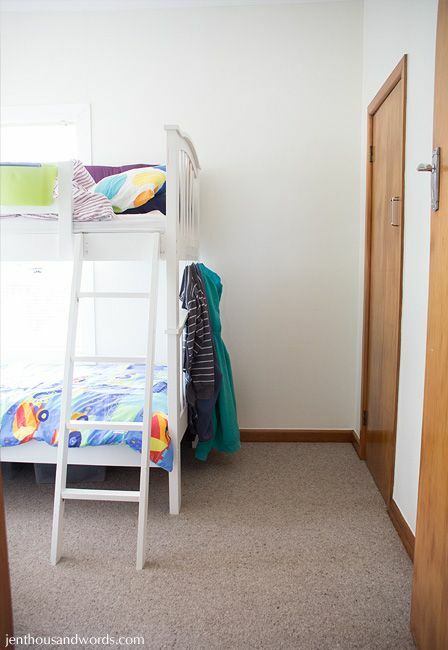 It also enables us to be flexible as the kids grow and their needs change - they can swap furniture between their rooms. 2) Although I did buy Daniel a dinosaur duvet cover (he was obsessed with dinosaurs for years) and Noah has a couple of car themed duvet covers (he has always been obsessed with vehicles and still is) I tend not to buy character sets or anything themed on a topic that might be a passing phase (for example, Daniel went through a Pokemon phase but no longer likes them). By sticking to duvet covers in plain colours or stripes I can add items that support a theme without having to replace all of the linens when a phase is over. 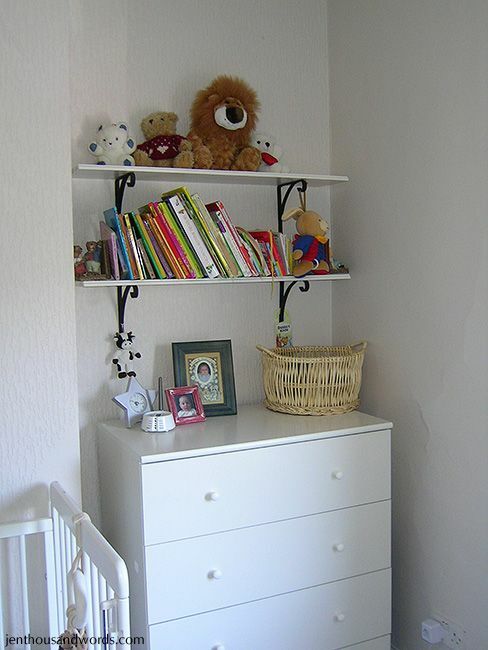 3) Get your child's input when organising their clothes and toys. 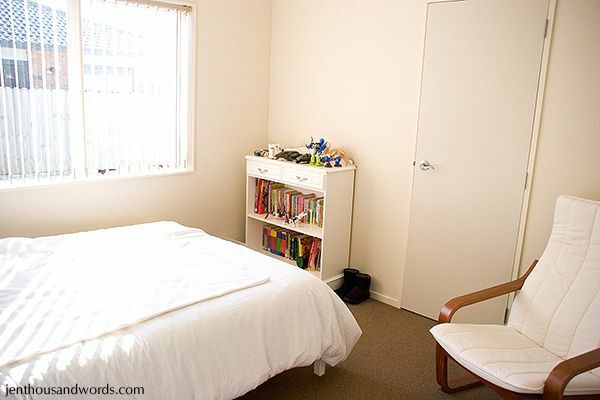 If the system makes sense to them (even if it doesn't make sense to you) they are more likely to keep their rooms tidy. 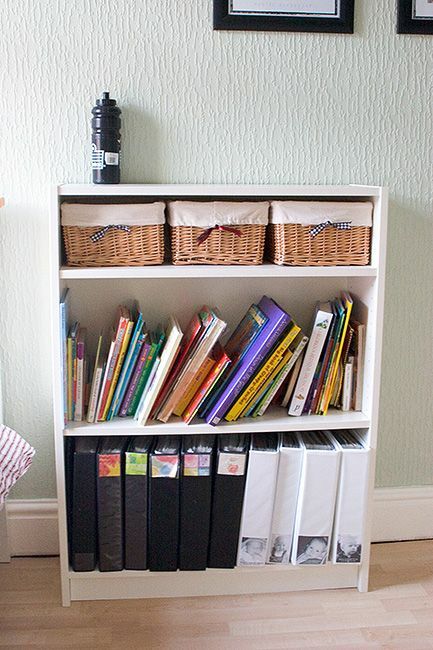 4) Make putting things away super easy for your children. For example, in Daniel's closet he has big plastic tubs holding his shorts, pyjamas, etc. 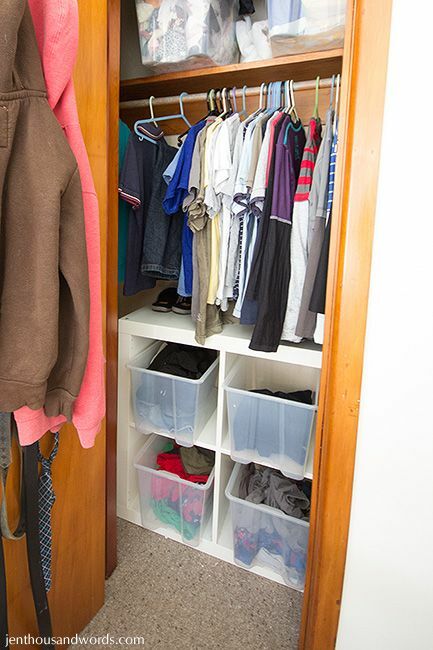 He isn't fussy about folding and tends to just chuck his clean clothes into the tubs but the closet still looks neat and he can easily access what he needs. 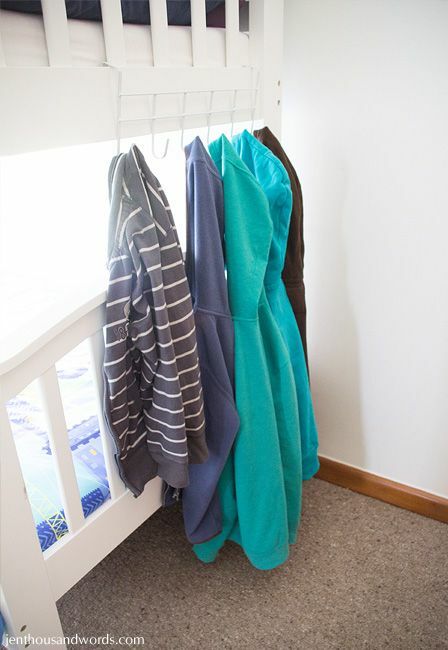 When the boys shared a room and had bunk beds I hung some over-door hooks to the end of the bed for them to hang their hoodies on. 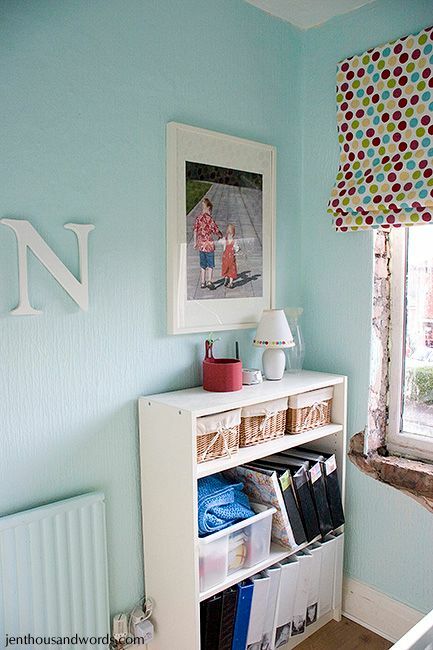 Do whatever makes it super easy for them to keep their room tidy!